ForexNewsNow – RoboForex is a New Zealand-based forex broker offering forex trading services to international clients. RoboForex allows clients to trade forex using a large variety of the most popular trading platforms. Traders also have the opportunity to trade using their mobile devices. Clients can set up different types of accounts depending on their individual needs and goals. 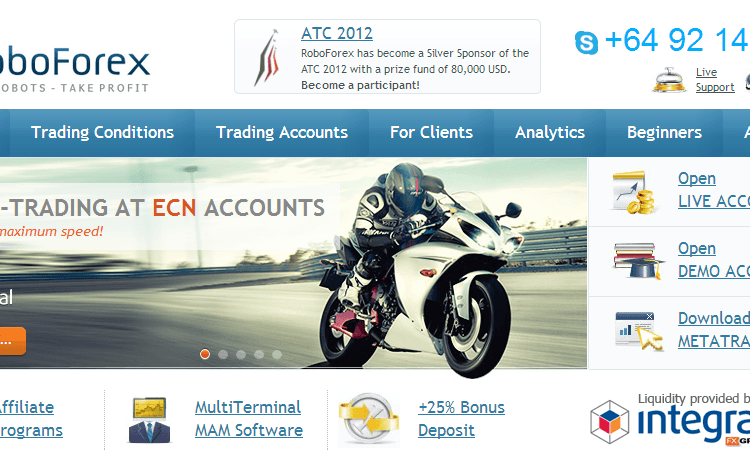 As hinted above, RoboForex employs some of the most popular FX platforms in the business. The two most popular platforms available at RoboForex are the MetaTrader 4 and MetaTrader 5 platforms. These are the most widely used platforms in the forex business. This is because they were designed to satisfy the needs to both beginner and advanced traders. Apart from these, RoboForex offers a platform for the iPhone, Android phones and Windows Mobile phones as well. These platforms allow traders to access their forex trading accounts right from their mobile devices from virtually every location that offers an internet connection. RoboForex clients have the opportunity to open different types of trading accounts. The spreads and leverage employed by the broker will depend on the account type opened by the trader. The initial account type is called “Fix-Cent” and only requires a minimum deposit of $10. In this case spreads start from 2 points and a leverage of 1:500 is provided. One of the most advanced account types is called CN-Pro NDD. This requires a minimum deposit of at least $1,000 and offers spreads starting from 0 points. This is something rarely offered by most forex brokers in the business. Between this and the first account type there are other account types for traders to choose from. RoboForex offers an attractive 25% bonus on deposits performed by new traders. The maximum bonus that can be claimed by a single trading account is limited to $5000 / €3500. The maximum amount of bonuses that can be claimed with all the accounts opened by a single trader is $15,000. The bonus amount can naturally not be withdrawn by traders straight away. In order to unlock their bonus traders will be required to execute a certain volume of trades depending on their individual account types. Overall the bonuses offered by RoboForex are much better than bonuses offered by most other forex brokers. Likewise, traders have the opportunity to receive rebates based on the monthly turnover of closed transactions. The more traders execute the higher rebates they will receive. Rebate payments are executed by the broker beginning each month. RoboForex is a member of the New Zealand Financial Services Complaints Ltd. The FSCL is a non-profit organization that has the goal to resolve disputes between financial service providers and their clients as well as B2B partners. The FSCL is approved by the Minister for Consumer Affairs of New Zealand. RoboForex is also a member of the Financial Service Providers Register of New Zealand. Unfortunately in order to become registered here the broker had to suspend all CFD trading operations and instruments. This measure was imposed by the New Zealand Financial Markets Authority. Traders can deposit and withdraw funds using a large variety of tools such as Visa, MasterCard, Liberty reserve, Moneybookers, Webmoney, CashU, LiqPAY, Payoneer Payment System and naturally wire transfer as well. Withdrawing money is extremely easy at RoboForex. Most withdrawal requests are processed within one business day with the exception of bank transfers and credit card transfers for obvious reasons. RoboForex is one of the best brokers when it comes to payment processing. The customer support of RoboForex can be contacted on a 24/7 basis using various communication methods such as Skype, Yahoo Messenger, email and telephone. The broker’s customer support is highly professional and ready to answer every question submitted by clients.